Whitening on corners, missing to markers but there are plenty to play the game without a problem. 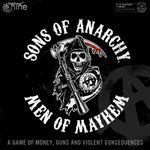 sweetner: Sons of Anarchy: Men of Mayhem – Grim Bastards This is just a promo player board. It is part of the Grim bastards expansion but came all by itself as a promo. It is included in base box.